Create CD ROM slide shows with sound ! Picture Player Software. Optimized for use on CD/DVD ROMs and PicturePlayer can be started from the CD/DVD without having to install it. Sound integration (background music or individual image sound settings) . Timer or keyboard-controlled picture advance . No unique DLLs or run-time modules . No registry procedure (applies to PicturePlayer only, not for ShowCreator) . 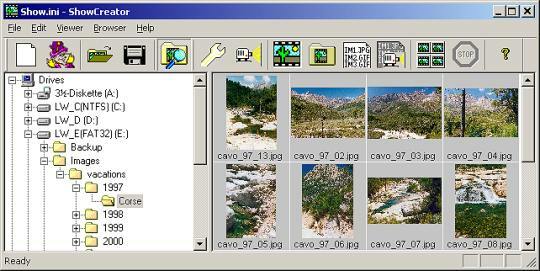 At 400 KB, PicturePlayer is very small and also suitable for use on floppy disk . Optional: Scrambler for protecting image files . Copy PlayStation 2 PC Game - Game cloner Copy PS2 PC Game. Digital PhotoRescue Pro - Recover lost media files from any medium. Game Cloner - Game copy and player for PS2 game or other game.